American escaped Hamilton, NY, with its first Patriot League win, 67-64 over Colgate. Here are our five key plays/sequences from the victory. American took a halftime lead and stayed in front by a small margin in the second thanks to a huge boost from its bench. The Eagles' subs outscored the Raiders 15-0 in the first half, and it was a team effort with Jalen Rhea, Lonnie Rivera, Matt Cimino, Charlie Jones and Alex Paquin all getting in the scoring column. While the bench carried much of the load for the first 35 minutes, AU's stalwarts seemingly put the game out of reach with a late 9-0 spurt to break a 46-46 tie. Delante Jones drove strong to the hoop to break the tie; Mark Gasperini, who recorded his first collegiate double-double (15 points, 10 rebounds), knocked down a 3 and then scored a putback; and Sa'eed Nelson stole an errant pass and coasted in for a fastbreak layup. But then American went ICE COLD from the free-throw line, letting Colgate come back from a 10-point hole in the last 90 seconds. AU went 3 of its last 12 in regulation. The Eagles finished a nightmarish 13-31 from the line. Colgate wasn't great, either, at 15-26 and if Sean O'Brien made one with 0.1 seconds left, the Eagles would be 0-2 in the Patriot League. Credit to the Eagles, they recovered from the collapse in regulation and sprung out to a five-point overtime lead thanks to strong takes to the basket by Gasperini, Nelson and Paquin. The Eagles didn't ice the game at the free-throw line, but rather with their defense -- getting three straight stops to end it. 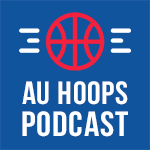 AU forced a long miss by Jordan Swopshire, then Delante Jones got a steal, and finally Delante recovered well to get a hand in the face of Francisco Amiel whose desperation 3 was way off the mark. And AU escaped.